Serve a delicious cheese platter in style at your next occasion. Made of gorgeous Acacia hardwood, this Round Paddle Board is functional and beautiful due to its rich, shimmering colors. The wood won't dull knives and the featured grommet allows you to easily hang the board on display when not in use or for air drying. 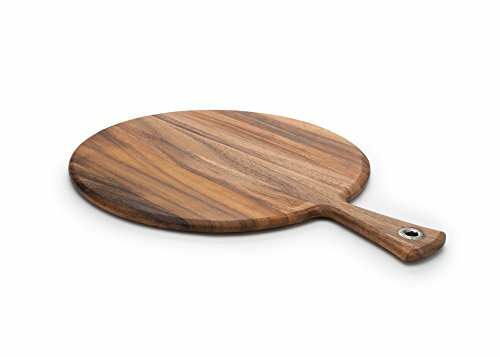 Paddle boards are perfect for preparing and serving foods, such as bread and cheese. Preparation and presentation, all in one. To remove any bumps that may form on the board, buff the area with a fine grain sand paper. Coat your board with butcher's block oil and allow to sit at least one hour prior to use. If you have any questions about this product by Ironwood Gourmet, contact us by completing and submitting the form below. If you are looking for a specif part number, please include it with your message.